There are dozens of events happening across the Atlanta area for Halloween 2018. Top Halloween events for families Atlanta is celebrating Halloween this year with parades, festivals and special trick-or-treat events across the city. Toddlers and preschoolers can show off their favorite costumes in a Halloween parade, costume contest and enjoy trick-or-treating in the museum. There will also be a spooky story time. Enjoy treats, costume contests, live music and more at Boo at the Zoo. The animals are also getting special Halloween treats. a free event for Zoo members and children under 3 years old. It is also free with general admission. Callanwolde’s fourth annual Halloween Night on Callanwolde Mountain includes live performances by the Callanwolde Concert Band and a LEGOLand Discovery Center and movie screenings by the Atlanta Film Society. There will be trick-or-treating, games and art activities, along with an all-ages dance party and costume contest. Atlanta’s Botanical Garden will be filled with kooky, creative scarecrows made by local businesses, artists and schools. There will be a Goblin Runway with fall-themed crafts and storytellers, along with train and pony rides. For the adults, there will be a cash bar and a Fest-of-Ale with live music. Families are invited to dress up in costumes for a special event at the Tellus Science Museum. Kids can design their own trick-or-treat bags, make shark hats and take part in a Halloween-themed scavenger hunt. There will be a special screening of “A Clue for Scooby-Doo” and a FANGtastic Halloween-themed planetarium laser show. The Atlanta Symphony Orchestra will host a magical afternoon in Symphony Hall with Harry Potter. Fans are invited to dress in costume and enter a pre-concert costume contest for the cutest, scariest and most creative costumes. The Pumpkin Festival at Stone Mountain Park includes storytelling, a dance-a-long parade and a meet-and-greet with Spookley the pumpkin. This year, thousands of carved jack-o-lanterns will light up every night. Yule Forest is home to one of the largest pumpkin patches in Georgia. Families can choose from pre-cut pumpkins or they can cut their own right off the vine. There is a petting zoo, cartoon forest and a hay maze. There will be special days for military families and families dressed up in costume. For one night, the Children’s Museum of Atlanta turns into a spooky funhouse. Kids can dress in their favorite costumes and do crafts, compete for prizes, watch performances and trick-or-treat. The Georgia Aquarium is turning into Georgia A-Scary-Um throughout the month of October. Dracula, Frankenstein and others will be visiting the Georgia Aquarium every weekend. On Halloween, kids can trick-or-treat with manta rays and beluga whales, with trick-or-treat stations throughout the Aquarium. Artists and food vendors will be help ring in Halloween in Atlanta’s Little 5 Points neighborhood. The parade route starts at Austin and Euclid and moves up Euclid to Moreland. It will turn south on Moreland to the Wrecking Bar Brewpub, then it’ll turn around and head to Freedom Parkway. Floats, bands and classic cars will be on display as the community celebrates Halloween. The parade begins at the Decatur Post Office on Ponce De Leon. Foggy gardens and historic haunted houses will be on display at the Atlanta History Center. LEGO build-and-take activity, haunted scavenger hunt, meet-and-greet with LEGO characters, costume contest, candy and more. Trick-or-treat at downtown businesses in Lawrenceville. Fun includes a look inside the historic courthouse and a family-friendly zombie walk. Participating businesses will feature a window decal letting trick-or-treaters know they are open for fun. Maps are available at the town's Concierge. There will be a petting zoo, trick-or-treating and face painting. The outlet center will host a trick-or-treat event with music, games and candy. The Vampirina Disney Junior Event is happening from noon to 2 p.m. The Great Pumpkin Festival will take over downtown Fayetteville, featuring trick-or-treating and games at local small businesses. There will be lit-up jack-o-lanterns decorating the square. There will be trick-or-treating, crafts, games and more. 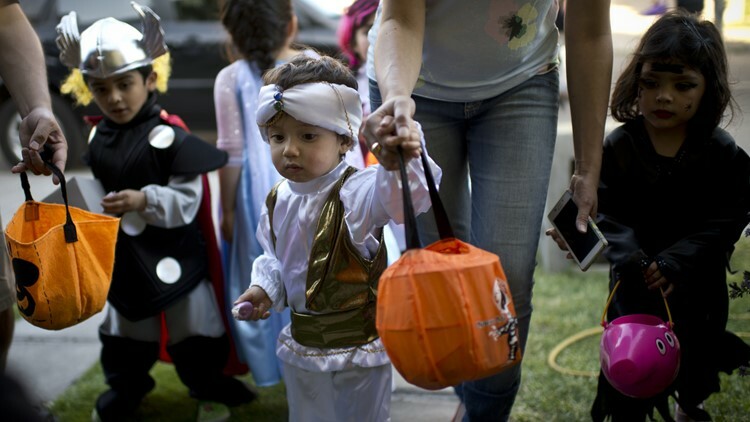 There will be a costume party, trick-or-treating with games, musics and contests. Stores participating will display a pumpkin sign in the window. There will be fall-themed crafts, giveaways and trick-or-treating, along with teal pumpkin events for those with allergy sensitivities. Contests, music and fall-themed festival games and inflatables will be there for kids ages 10 and younger. Costumes encouraged. Walk from store to store in the mall and collect Halloween treats.